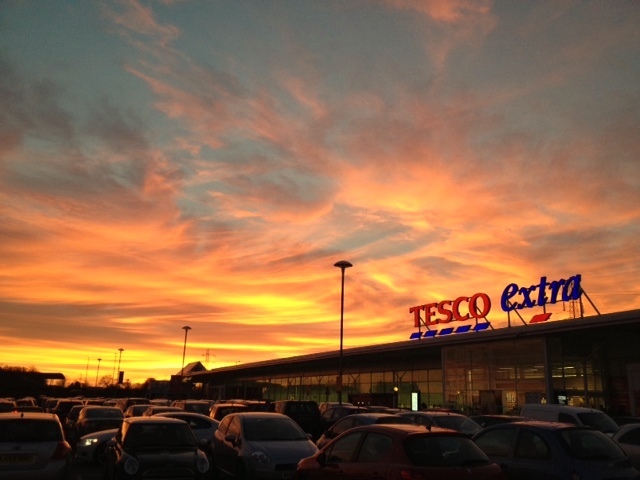 On exiting Tesco’s after doing the weekly grocery shop I discovered that I’d been missing the best sunset I’d seen for quite some time, 360 degree colour! After taking a quick iPhone picture, I quickly decided to dash home to drop off the shopping, grab my camera gear and then to head to the nearest photo location: the Infinity bridge in Stockton. I missed most of the colour but caught the after glow on what was a perfectly still night, the water like glass. I set up for the shot just in time for blue hour, when all of the town’s lights have switched on. 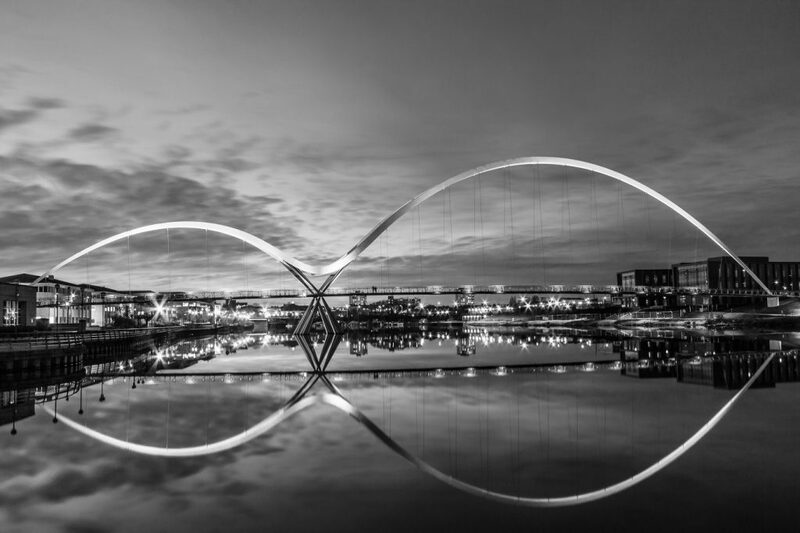 The perfectly calm water reflected the Infinity Bridge lights and showed why it got its name. 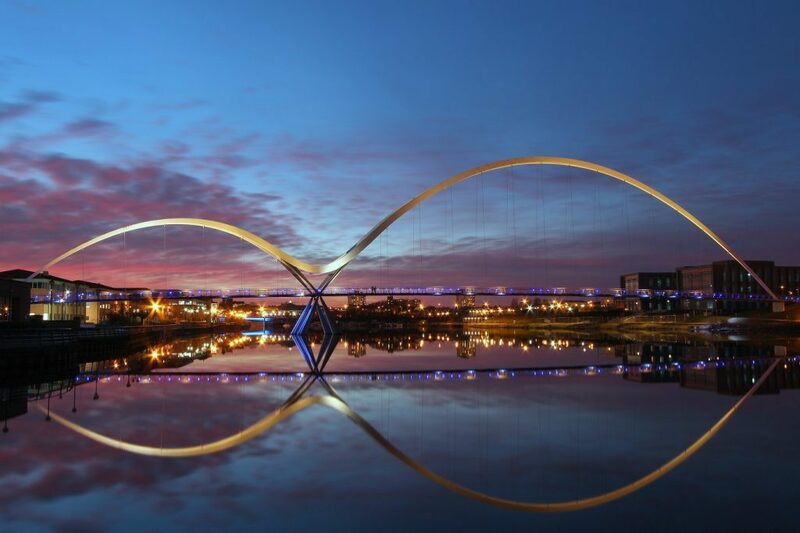 “The Infinity Bridge is a public pedestrian and cycle footbridge across the River Tees in the borough of Stockton-on-Tees in the north east of England. The bridge is situated one kilometre downriver of Stockton town centre, between the Princess of Wales Bridge and the Tees Barrage and it links the Teesdale Business Park and the University of Durham’s Queen’s Campus in Thornaby-on-Tees on the south bank of the Tees with the Tees Valley Regeneration’s £320 million North Shore development on the north bank. A special feature is made of the way the bridge is lit at night. This lighting scheme was designed by Speirs and Major Associates who also designed the lighting for the Burj Al-Arab. At night the bridge handrail and footway are lit with designer blue and white LED lighting built into the handrail that changes colour as users cross. Attached to the steel cable ties are white metal-halide up-lighters to illuminate the white painted bridge arches, and blue LED down-lighters to illuminate the water and ground surfaces immediately below the deck.At night from certain viewing angles when the river surface is flat calm, the twin arches together with their reflection in the river appear as an infinity symbol ∞, and it is this effect that inspired its name. At the start of construction a temporary jetty was built on the south bank to enable the building of a cofferdam for the safe construction of the central pier. In April 2008 the supporting legs were added to the central pier.Steel falsework was constructed in the cofferdam by Dorman Long[ to support the ends of both incomplete arches as they cantilevered over the river during construction. The first steel arch made from four pieces of fabricated steel welded together, was put in place in June 2008 and was later used to stabilise the cantilevering lower portions of the main arch using a strand-jack and tie cable between the top of the small arch and the large arch and then to reduce sway stress during its progressive construction of the large arch. 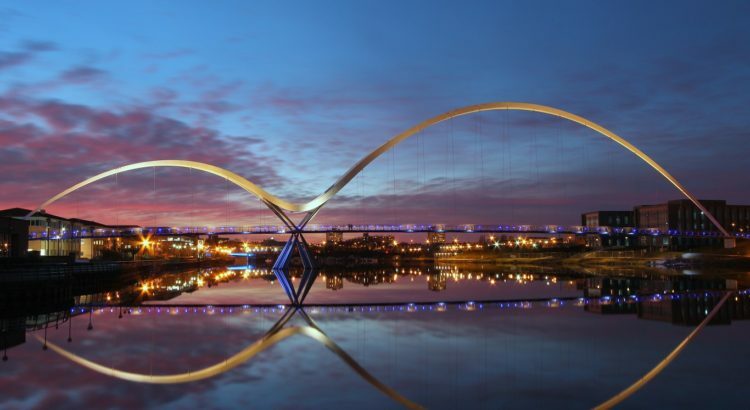 The final section of the main arch came in four pieces which were welded together on site and on 5 September 2008 all 170 tonnes of it was lifted into place by a 1,500 tonne mobile crane, the largest in the country. The crane, a Gottwald AK680 owned by Sarens UK is based in nearby Middlesbrough. The crane is 80 metres (262 ft) high with a maximum of 1200 tonnes of superlift, requires 45 transport wagons to move it,and takes three days to set up using a 100 tonne crane. The concrete deck panels were cast on site using three steel moulds in temporary sheds in a construction compound on the north bank of the river. Using a short temporary jetty on the north bank the deck panels were floated out on a small barge and jacked into position working progressively away from the river pier. The concrete deck sections are held together by steel welds and adhesive. The footbridge was completed on time and to budget in December 2008 with 530 workers and uses in total some 450 tonnes of Corus steel,1.5 km of locked coil steel cable, 780 lights, 5,472 bolts and weighs 1040 tons. Almost all labour, materials and components were sourced locally. The bridge was officially opened on 14 May 2009 with celebrations including a sound, light and animation show, parkour freerunners who climbed the bridge arches with flares, and a specially composed music track and synchronised pyrotechnics from the bridge itself with big screens for the estimated audience of 20,000 spectators along the banks. The bridge was opened to the public two days later. Foot traffic is anticipated to rise to some four thousand people a day as the North Shore site develops. That sunset was truly, end of days fantastic. Wish I had managed to get out myself!